– Nicolás Almagro has never played Rhyne Williams. – Rhyne Williams is into his first ATP semifinal. The kid from Tennessee loves the clay, and has won 3 Futures events on the surface. – Almagro will try to make his 19th clay final, and add to his 12 ATP clay titles. – Juan Mónaco has never lost at the River Oaks Country Club – he’s 6-0 here. 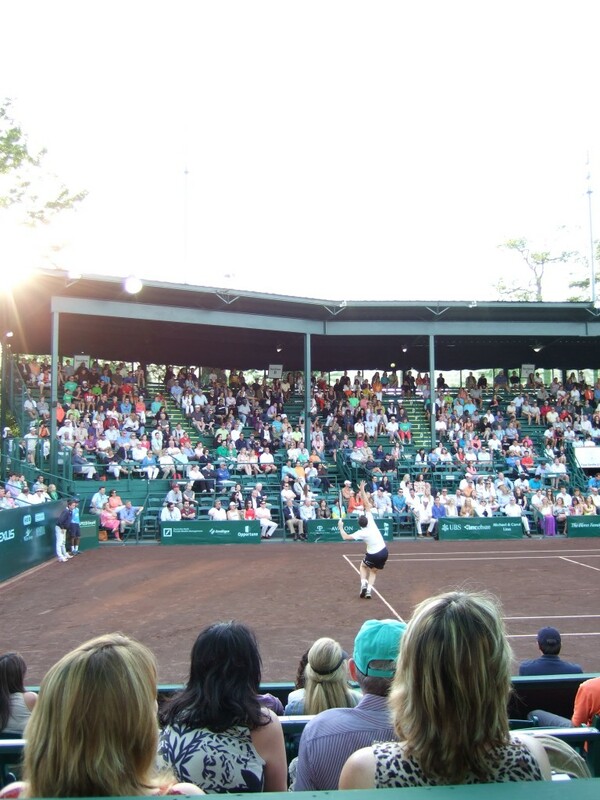 Remember, the tournament used to be held at the Westside Tennis Club before moving to River Oaks. 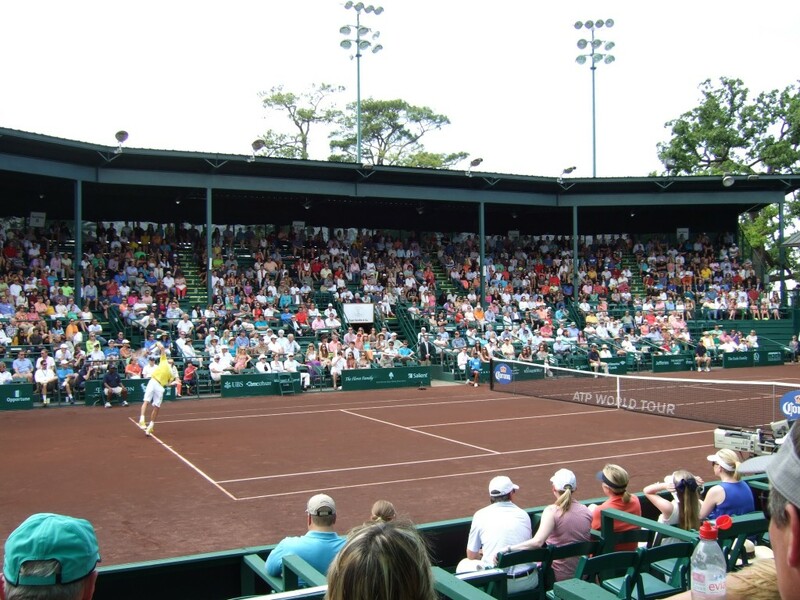 Mónaco did play the 2007 Men’s Clay Court Championships held at that other Houston club, and lost to James Blake in the quarterfinals. – Mónaco will try to make his 15th clay final, to see if he can add to his six clay titles. – John Isner is into the semis at the Men’s Clay Court Championships for the second year in a row. – Bob and Mike Bryan are the first doubles team to in ATP History to reach the 800 win milestone. The twins have won this event four times, are into their sixth final at the tournament and are on a 19-match winning streak at the tournament. All of which is pretty nuts. This ended up being a very straightforward match for the top seed. It was pretty evident that Rhyne Williams couldn’t overcome the physical issues that he had to deal with at the end of yesterday’s tough three setter vs. Ramírez Hidalgo (the first set of that match took over an hour, and it was played under the harsh noon sun). As you might recall, Rhyne did tell us after that match that his left quad/glute was acting up on him. On the other side, Nicolás Almagro played a nervous first set, but served well enough to hold Williams at bay, and defended very well whenever Rhyne Williams wanted to use the drop shot (a strategy that never really paid off for Rhyne). In terms of tactics, it was clear that Almagro got some tips from Ramírez Hidalgo about going after Rhyne’s forehand corner. The American struggles to defend that side of the court, and Almagro didn’t even try to first create space by hitting to Rhyne’s backhand corner to create space: the man from Murcia was going right at the forehand corner. Almagro played a much more composed second set, which is evident by the scoreline. The 12th best player in the world loosened up noticeably, and the winners started flowing from his racquet. And Rhyne Williams wasn’t being able to find ways to win points on his serve: by the 2-0, Rhyne had won 44% of points played on his first serve, and just 29% of points played on his second serve. Rhyne ended up winning just 16 points on serve (9 with his first serve and 7 with his second serve). And the Tennessee man only won 14 points on return (5 on Almagro’s first serve, and 9 on his second serve). I noticed that the American was taking an aggressive return stance for both Almagro serves: Rhyne was standing near the baseline for Almagro’s 1st delivery, and well inside the baseline for his second serve. The strategy paid off in the latter scenario, but not in the former. – He didn’t quite move the way he wanted today. He was very sore, and even though he did everything he could to recover from yesterday’s match (ice bath, big meal, bike, stretching), he just couldn’t be as sharp as he wanted today. Rhyne did mention that he’ll be working hard to improve his fitness so he can recover better in the future. – Asked about what Almagro does at such a high level, Rhyne mentioned Almagro’s massive serve to start, but then said that it’s also the other things around that serve that make Almagro such a tough match-up: the weight of his shots, the heaviness, the depth, the angles, and the ability to get a deep ball back on points where he’s on the defensive. 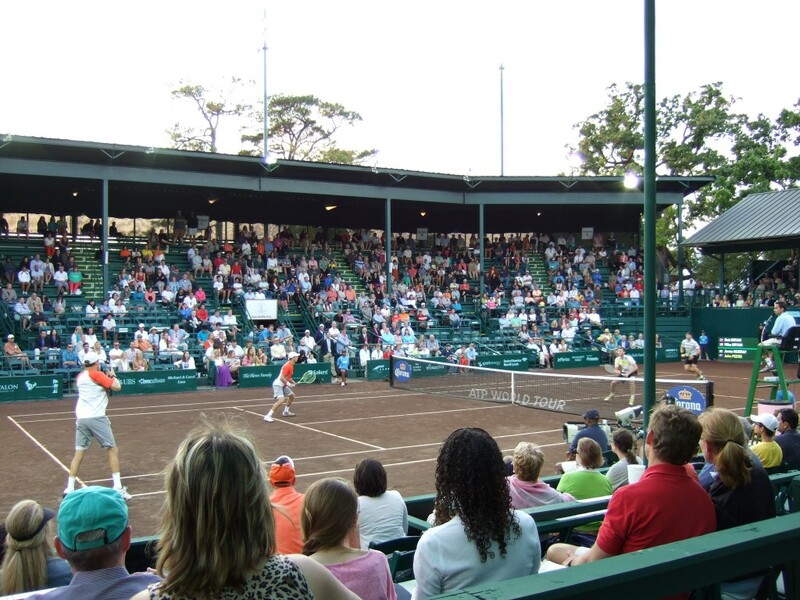 – Rhyne will be heading to Sarasota for the Challenger there (played on Har-Tru). He’s trying to get a flight out there today. – Williams wants to get into the French Open, but he needs to get his ranking a bit higher (he’s about 10 spots out). – Almagro said he thought he played better than the first two matches, and was quite happy about how he moved out there (definitely the best he’s covered the court so far). – Nicolás is well aware of the difficulties that either Isner or Mónaco present in tomorrow’s final. – Almagro was asked why he had different colored shoelaces on his shoes: the answer is actually quite simple: during the Monfils match one of his shoelaces broke, and he only had a bright colored one to replace it with. – I asked Nicolás about what Darren Cahill said about advising tennis pros never to switch racquets or shoes during their career, given that the Spaniard went from using Reebok shoes to Lotto at the beginning of the season. He said that his contract ended with Reebok at the end of the year, and that Lotto came in with a good offer. He likes the shoes a lot, so no issues there. The surprise came when he started talking about his racquet, unprompted: he mentioned that he’s now using the same racquet that he used at the Australian Open, but that he had to change it for the Latin American clay swing. However, Nicolás didn’t like the new racquet, so he’s back to the Australian Open one, which will be the stick he uses for the rest of the year. Mónaco-Isner updates will come when that match is over. 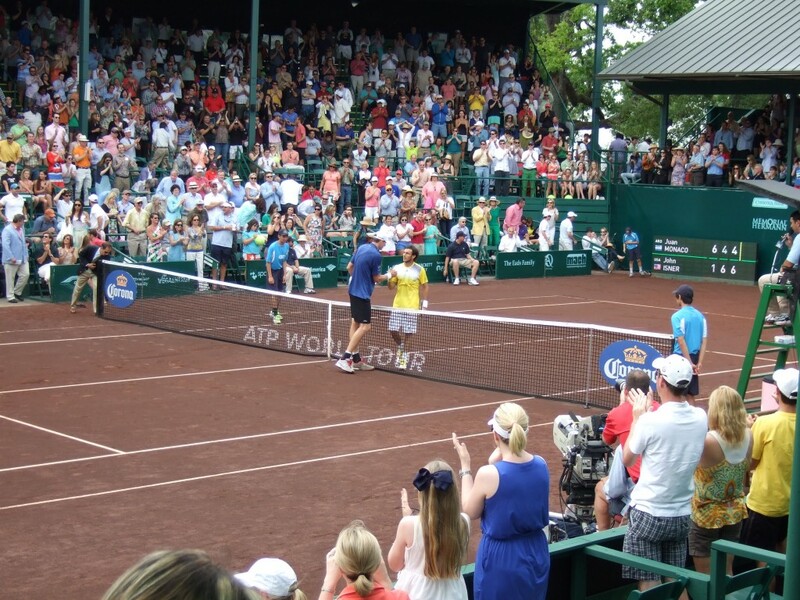 John Isner ended up exacting some revenge on his good friend after all. Though the final outcome seemed far from realistic after the first half an hour of this semifinal. Juan Mónaco breezed through the first set, continuing on a hot streak that saw him lose just 3 games in four consecutive sets of tennis, spanning three matches (the second set of his match vs Smyczek, the entire Ginepri match, and this first set of today’s semifinal). Mónaco got a lot of serves back in play, and it didn’t help Isner’s cause that he was just getting in 44% of 1st serves in during that opening set. To make matters worse, Isner had more double-faults than aces (4 to 3) in that breadstick. However, things improved dramatically in the second set for the tall man from Greensboro, North Carolina. His first serve percentage went up to 71%, and he only lost 10 points on serve (7 of which came on the 1st serve – go figure). On the other hand, Mónaco cooled off significantly, and he couldn’t handle the fact that great tennis stopped flowing from his racquet. The man from Tandil became much more tentative, playing the kind of match that Isner’s opponents tend to play: taking a lot of pace off his shots, preferring to focus on placement and moving Isner around, knowing that an error can come at any point from the other side of the court. This was evident in the 2-all game of the second set. Mónaco played an erratic and passive couple of points, tossing in a few UFEs on shots that weren’t even trying to be aggressive. Then at 30-all, Isner connected on a great second serve return winner to set up break point. And in that pressured moment, Mónaco missed a regulation backhand off a neutral return by Isner. And that was the set. From up close, it was such a tame error: Mónaco had all the time in the world to hit a high percentage cross-court shot, yet he pushed it wide by more than a few inches. It was a somewhat shocking miss at such a crucial point of the match (any break points you face against John Isner qualify as a pivotal point). That break propelled Isner forward. The first challenge for John was staving off two break points in the very next game. Both were successfully negated with great wide serves. After that hold, it became evident that Isner had received a shot of confidence from getting that crucial edge, and the big man continued to serve well. Isner was also coming to net at the right times, finishing off points with great anticipation after he had Mónaco on the defensive. When Isner’s serve is clicking, his first few groundstrokes in a rally are strong, and the big man is looking for opportunities to come to net, the task for whoever is playing him becomes that much harder. 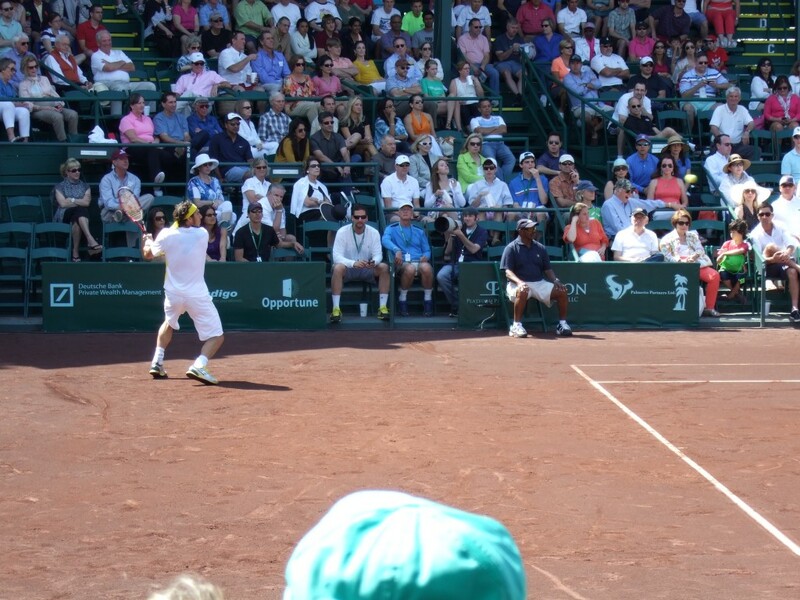 This is how back Mónaco was standing to return Isner’s serves. The third set had to be extremely disappointing for Mónaco, who got broken in the very first game. Again, it was the backhand that let him down: from 30-all, the Argentine committed two straight unforced errors off that wing to hand Isner what ended up being the deciding break. Mónaco never created a break chance in the third set, and a couple of half chances (a 0-30 look and a 30-all look) went begging after more unforced errors. It should be said that Isner was doing a wonderful job of putting pressure on Mónaco’s second serves: after winning 60% of points played on that serve in the first set, Juan only won 44% and 43%of points played on that delivery in final two sets. Mónaco’s return of serve also deteriorated: he went from winning 55% of return points in the first set to just 31% and 30% in the last two sets. This last element turned the match into a classic John Isner kind of battle: the American gave very little away in the last two sets, and he was ready to pounce when an opportunity to break arose. Isner created only 3 break points in the entire match (one per set), and whenever he converted those chances, he won the set. That kind of efficiency will always aid a man whose margin of error is, by nature, always small. John and Juan will be in the press room shortly, and as soon as they leave I’ll update this post with highlights of their pressers. – Juan noticed that Isner improved significantly in sets 2 and 3. Acknowledged how well Isner played in those last two sets – he said Isner gave him very few opportunities and hit the ball harder. 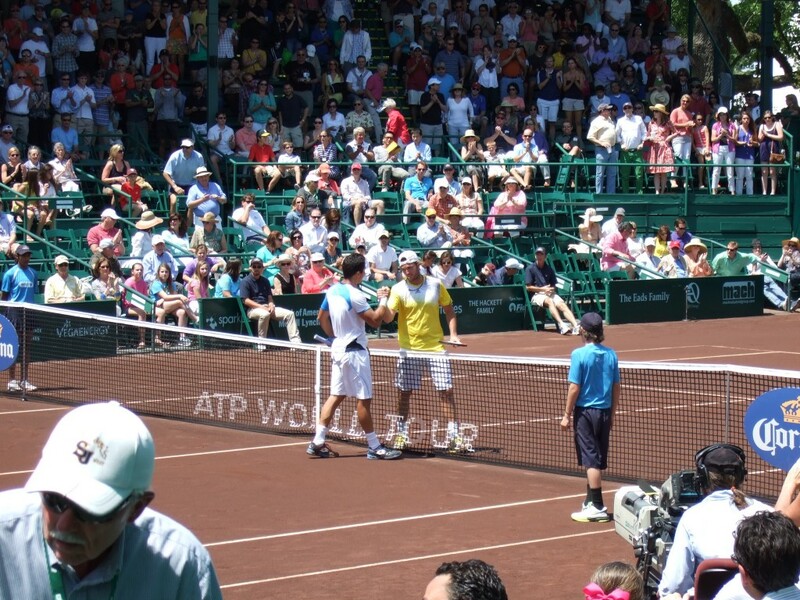 – Mónaco said that he felt fine, and that it was just a tough, close match. He admitted he wasn’t as sharp as he wanted in the key points, and that his intensity dropped a bit. – Juan is quite happy about the two wins, even though he wanted to defend the title. He says he was a little mentally saturated from Davis Cup, and that winning matches and playing well right after that happened is always a good thing. – Mónaco is quite excited to start the European clay swing, since he suffered that unlucky injury at Monte Carlo last year. He’s flying there today. – The Georgia Bulldogs fan said that even though he got “creamed” in the first set, he felt like he was hitting the ball very well. He wasn’t serving well, and barely missing on some forehands. He said that it was key to get that first hold in the second set, because it was from the end of the court where the sun was giving him trouble. – John was happy with his serve in the last two sets, naturally. And he’s delighted at making the final again. He said that missing Australia kind of wrecked his rhythm, mostly in the mental aspect of his game. But he’s confident that he’s turning a corner on such a disappointing first trimester of the 2013 season. – Isner was full of praise for Almagro’s serve, and the way the Spaniard defends said serve. He also remembered last year’s tough loss to Almagro in Davis Cup, and said that Almagro is very good on all surfaces, not just clay. John knows it’ll be a tough match, and that both of them will most likely be on the same flight to Monte Carlo after it ends. – John is not all that concerned about drawing Gulbis in the Monte Carlo first round: he says that when he feels confident, it doesn’t matter much to him who he’s playing. – I asked John about how he felt about his transition game, which I thought was excellent in the last two sets. Isner said that he was happy about many aspects of his game, even though he missed more than a few forehands (which he said had been a recurring theme this year), but that this shot is coming around, and that he needs to keep swinging at them. And yes, he was pleased about how he did at net today. Onward to the doubles final! That was a very unique final. The Bryans came flying out the gate, and got a 5-0 lead in the first set after what seemed like five minutes. They delivered a first set breadstick soon after that. John Peers was completely out of sorts: the Australian gifted the Bryans the first break of the set via a tight double-fault. The second set had no breaks of serve, but the Bryans had a couple of break chances at 2-all on Jamie Murray’s serve, but the Scot did well to fend them off. 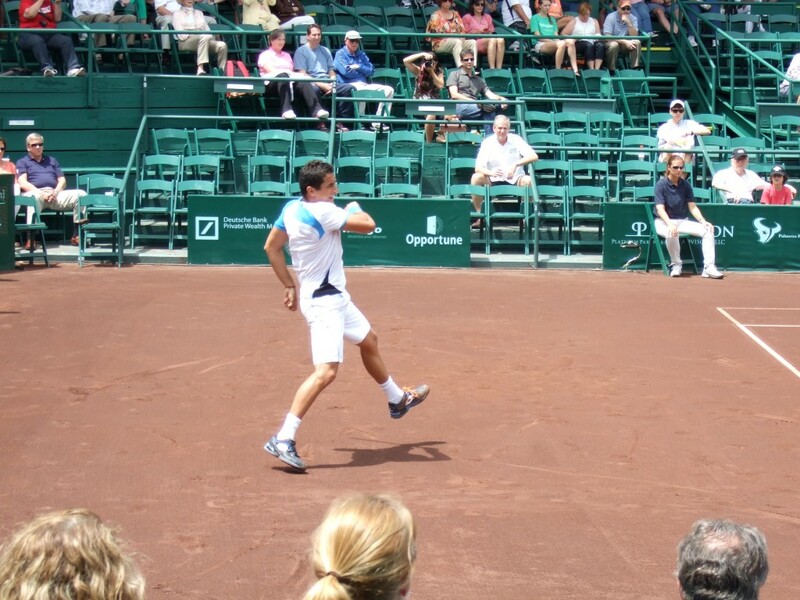 However, the Bryans didn’t have much problems holding serve, and the set marched into a breaker. Once there, the Bryans went up 3-0 in more or less the same domineering manner they had taken the first set. The match seemed like it would end in mere minutes. And then…something strange happened: there was some mis-communication between the twins on how to handle a Peers return, and suddenly, the underdogs were on the board. Not content with that, the Murray/Peers team rattled off seven straight points after that, taking the tiebreaker 7-3 and opening the super tiebreaker with a minibreak. That advantage was soon lost, and the two teams engaged in a tense tug of war that went on until the very end. The Bryans held championship point at 9-8, but here is when John Peers was enormous. He first hit a great 2nd serve and followed it up with some classy backhand volleys to stay alive, only to then top that off with a blistering ace to give the underdogs a championship point of their own at 10-9. 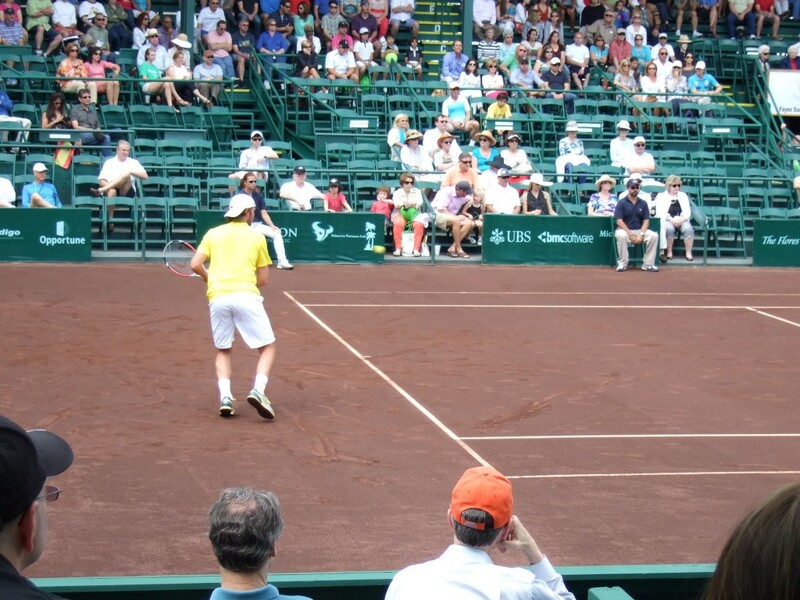 The Bryans stayed alive, but at 10-all Mike Bryan double-faulted – the second serve clipped the net and floated in the air for what seemed like an eternity. Agonizingly, it landed out. Jamie Murray had the title on his serve, and he hit a pretty great delivery to set up his partner for a clinching volley at net. What an upset. – Peers made us laugh by saying that at least they were wearing black shorts during their match, since they had to jump into the Country Club pool, per the tournament’s tradition. 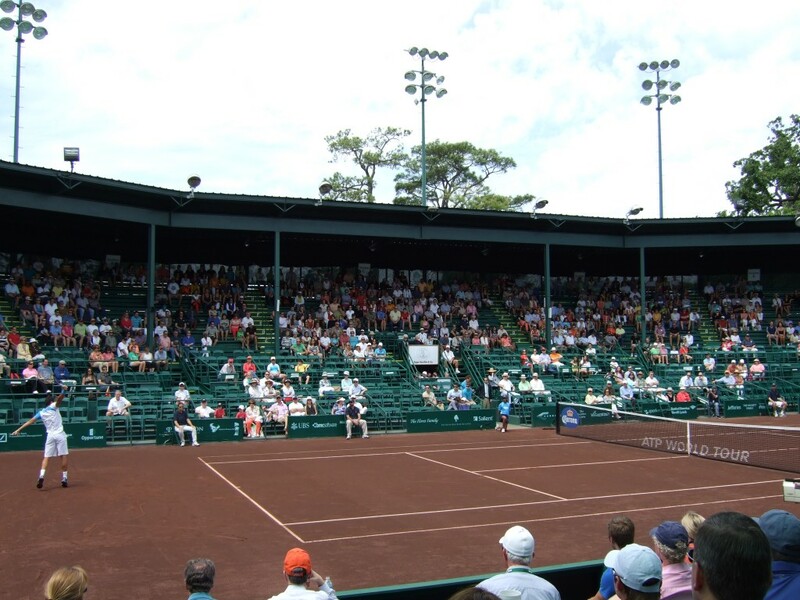 – The team will be playing the Sarasota challenger next week. 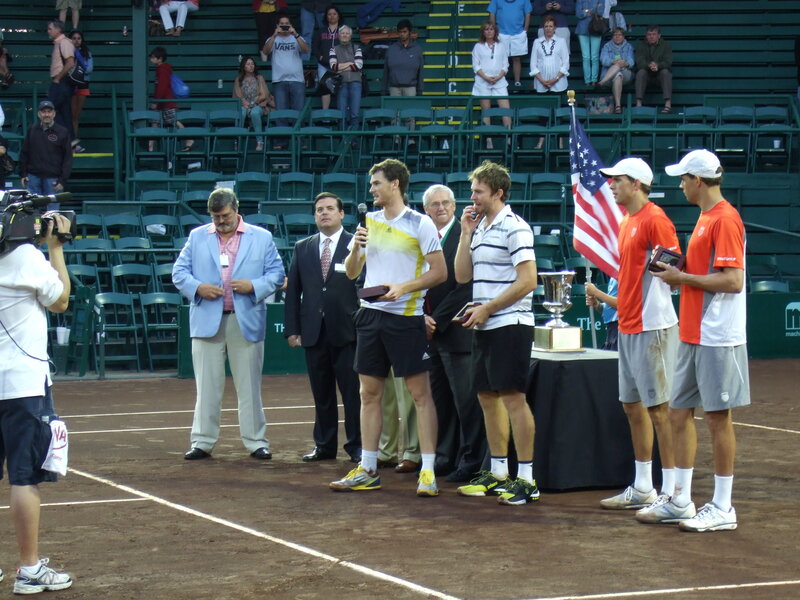 – Jamie was quick to acknowledge how special it is to beat the Bryans (who he called the best team of all time) anywhere, let alone here in the US. – Jamie talked about the strange nature of doubles, where momentum shifts so violently, given the scoring system that’s used for ATP events (no ad scoring, super tiebreaker instead of third set). He said they got “drilled” in the first set, and then less than an hour later they won the title. – Neither Jamie nor John knew about the Bryans’ winning streak (of 19) that they snapped today. At the end I congratulated John on that incredible ace at 10-all. That was enormous. And that’s it for today. See you here tomorrow for the singles final between Almagro and Isner!